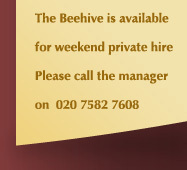 Our Mission at The Beehive is simple , we aim purely to make the experience of each and every customers' visit as pleasurable visit as possible. This is something that has been learnt over the years and is something that we are confident in delivering. We recognise that quality derives from excellent service, which is something that we strive to deliver. This ethos and attitude has been adopted by management and all staff for some time now and hence has become second nature. 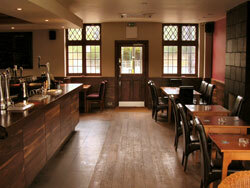 As of mid 2005, The Beehive has undergone a total interior facelift, creating a warm, friendly and inviting atmosphere. With newly laid solid oak flooring, slate fireplaces, leather couches and conservatory extention, The Beehive has managed to metamorphosise itself into a truly memorable experience for any customer that steps through the door. 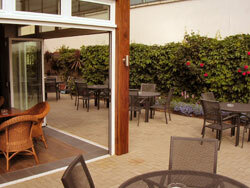 The garden wasn't left out in the renovation and now boasts an idyllic place to relax and unwind. As you can see from the photos the conservatory leads directly out into the garden through the means of french sliding doors. With buildings on all sides, this acts a a shelter from any wind that may disturb your stay. "We guarantee you will not leave unsatisfied"